Ellenwood Lake Provincial Park is a short 20 minute drive from downtown Yarmouth. It is located just 19 km (12 mi.) northeast of Yarmouth and 1.6 km (1 mi.) south of Deerfield. Exit 34 off Highway 101, proceed 6.5 km (4 mi.) along Route 340. Follow signs to the park entrance. Our civic address is: 1888 Mood Rd, Deerfield. Or… from the corner of Starrs Road, take the Hardscratch Road all the way to the end. When you reach Hwy 340, turn right. Continue along Hwy 340 to Saunders Road and turn right again. Drive along Saunders Road until you see the sign for Mood Road on your right. Turn right onto Mood Road. Ellenwood will be a few kilometres along Mood Road on your left. Park at the gate and BE SURE TO SIGN THE LOG BOOK as you enter! 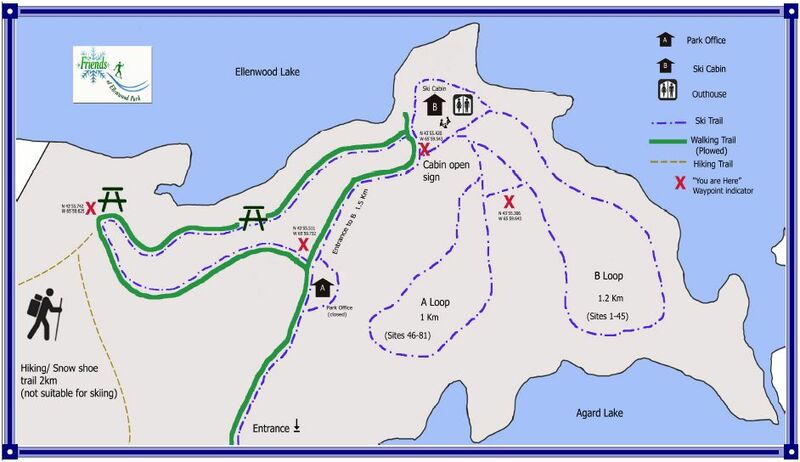 The ski cabin is down by the lake at the end of the main paved driveway – a 20 minute walk from the Park entrance. Look for the children’s playscape and you’ll see the cabin beyond. Just follow the park map in our Brochure located in this website! Click on the image of the Park Trail Map to enlarge and print!